First prep the salmon dish. Take an oven dish and lay the pieces of salmon in it. Peel the onion and cut it in fine rings. Peel the carrot and cut in in fine slices. Sprinkle the onion and carrots over the fish. Season with salt & pepper. Put a small bit of water in the oven dish and sprinkle the crumbled fish stock in the water around the fish. Cover the dish with plastic wrap. Puncture some holes in it with a knife. Voilà, the fish dish is ready, but we wait until our potatoes are almost done to cook it in the micro wave. Peel the potatoes and cook them in water with salt, as you normally would do before making a mash. In the meantime, peal the garlic and stab it to the end of a fork. Heat some olive oil or margarine in a large cooking pot and stir with the garlic clove in it while the oil is heating up, the oil will take the aroma of the garlic. Once the oil is hot, put in the rinced baby spinach leaves and stir from time to time. Season with pepper and salt and crumble some meat stock over the spinach. About 10-15 minutes later your spinach will be done. Put the salmon in the micro wave for 5 minutes. Take out the oven dish and tilt it in different directions to mix the crumbled stock with the water. Put the fish back in the micro wave for another 5 minutes. Check from time to time how far the fish is cooked and add some more minutes each time if you are afraid to overcook it. In my experience the fish is exactly right as soon as you start smelling the aroma in the kitchen. When the potatoes are cooked, drain them and make a mash. Add the cooked spinach. Add some extra seasoning like nutmeg and optionally some milk if the mash is too dry. This depends on how much fluid was in the spinach. Yes, there is neither butter nor cream used here. The whole idea is make a light meal which is tasty. But if you must you can make the mash richer. The vegetables with the fish are there for seasoning really, since the cooking time is often too short to have them ‘well-done’. I tend to add onion and a carrot because I always have some in the house, but plenty alternatives are possible to add extra taste to the fish like tomatoes, rosemary, lemon, etc. Feel free to share your favourite flavors. You can also add some white wine instead of water. But hey, this post was supposed to inspire your light calorie cooking. 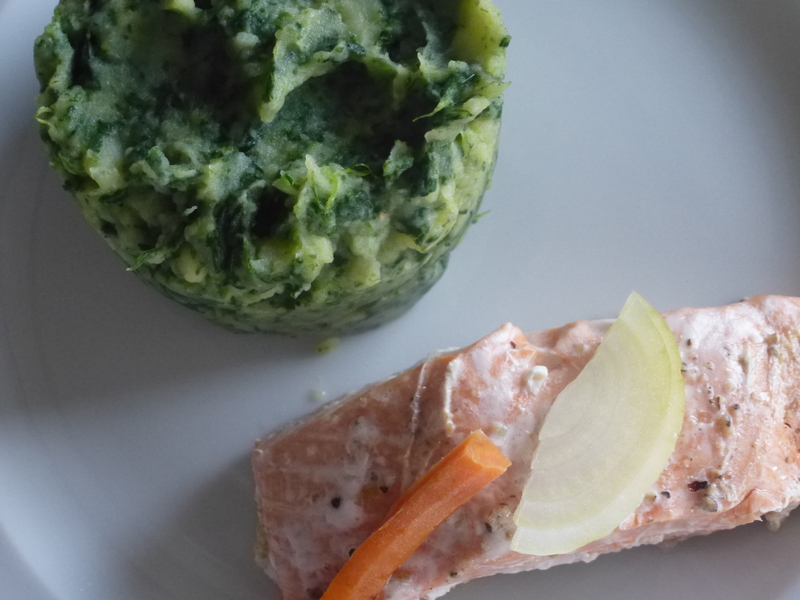 This entry was posted in Diet, Fish and tagged baby spinach, carrot, fish stock, garlic clove, low calorie, mash, Mashed potato, oven dish, salmon, spinach by petratant. Bookmark the permalink.